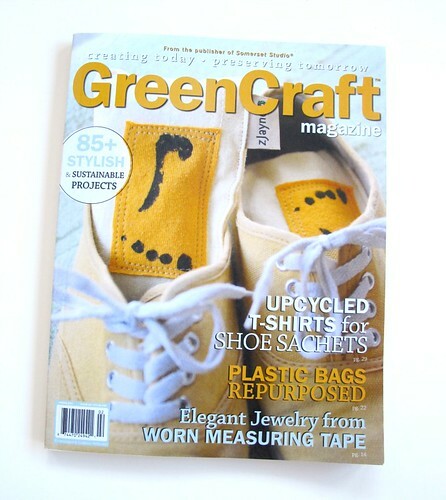 I was so happy to pull the latest issue of GreenCraft, out of my snowy mailbox on Friday. Unfortunately, I had to show complete restraint and only glance at it. I had major prep for my daughter's cat party on Sunday, and there wasn't time for any distractions. After a full weekend of paint, frosting, balloons, and lots of CATS... my treat was to crawl into bed and leisurely go through the spring edition. I was honored to be asked to contribute my instant recycled paper flowers and couldn't wait to see how they'd be photographed. Many months ago I created an entire box of assorted paper flowers and thought they looked so lovely clustered together as I sealed them up for mailing off. Apparently, GreenCraft felt the same way upon opening that parcel! And here they are! 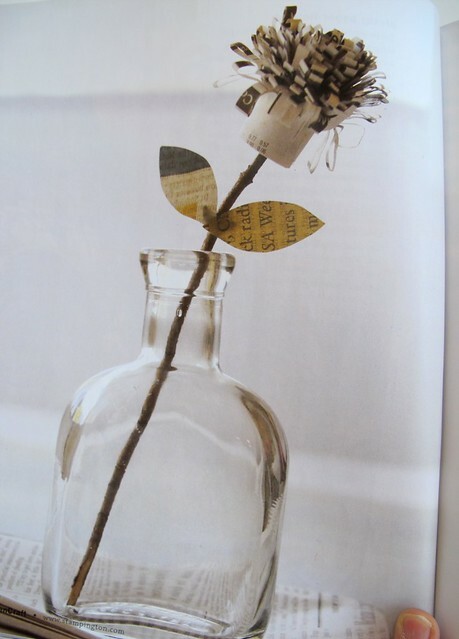 Even one can make a strong statement as a solitary, long-stemmed (twigged) blossom. 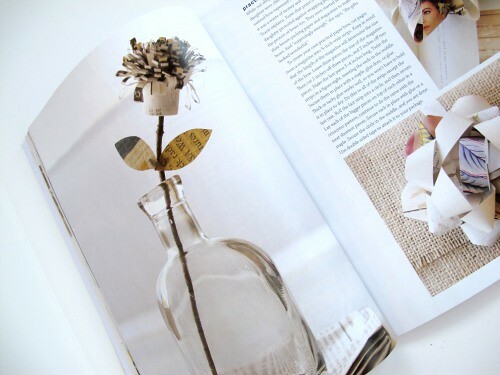 The entire magazine is filled with fun ideas and new twists on using old materials. 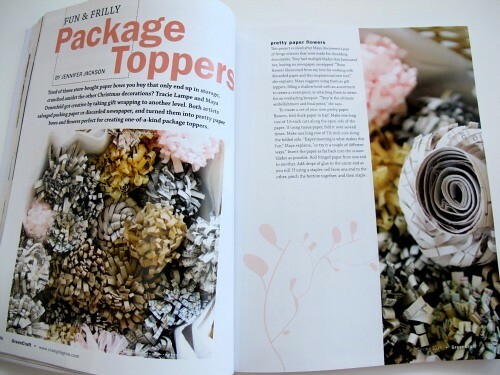 In this issue I recognized a strong emphasis on projects containing sewn paper, a personal favorite. 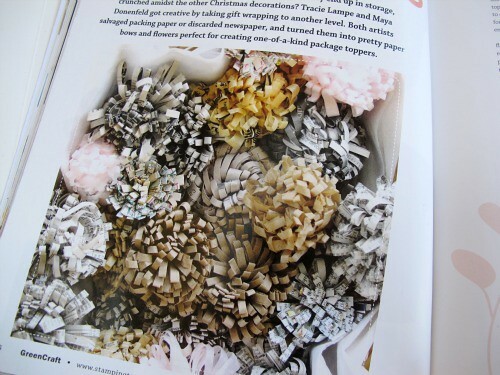 In fact, I was so inspired by scrap paper being quilted and pieced together by artist Jeannine Stein, that I'm curious to go investigate her book: Re-Bound: Creating Handmade Books from Recycled and Repurposed Materials . I'm pretty sure GreenCraft has hit the newsstands, so go check it out! I'll be returning with a post or two on all of the fun party details, including my piñata escapades. Now THAT would be romantic! I can't wait either, Corrine. Oh, that book has been on my Amazon wish list for a while! Hmm, I'll have to see if I can find that magazine locally... I hadn't heard of it but it looks really great and I'm sort of fascinated with sewn paper, too! Congratulations that your work is in the book. It looks really lovely and a really wonderful idea. very cool, i need to find a copy of this. Congratulations, what a great thing to see your work in a lovely magazine like that. Have fun with the cat party, can't wait to see pictures of it! PS: I own and love Rebound; it has some great projects! Having made our first sewn paper bunting today, I can see why you are fascinated by sewn paper. My son could not take his eyes off the sewing machine. Beautiful flowers. I'll have to look for the magazine. i'm not sure that I'll be able to find a copy here. Congratulations! I can't wait to see your article as it looks very interesting! Congratulations! You've made a great job. Beautiful flowers.